Passengers may try to avoid checked-bag fees by carrying on items, but there are rules to follow. 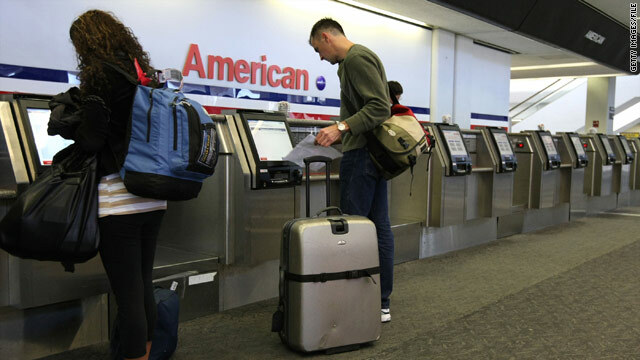 (CNN) -- As airlines keep hiking their checked-bag fees -- as Delta and Continental did recently -- there's more incentive than ever to schlep carry-on bags onto the plane with you. Go for it. Just don't be a jerk, follow a few simple etiquette rules, and everything should work out fine, travel experts say. • Obey government and airline rules on the size and number of items. You can use the template at the gate, but it's better to know your items comply before you get there. Dimension limits can vary, so what works on one airline may not work on another. Be sure to check with your specific carrier's Web site, and get out your tape measure. • Don't attempt to bring prohibited items such as sharp objects or bottles of liquids. The Transportation Security Administration sets these rules, and it's not fooling around. Don't even think about trying to sneak something through; in the current security climate, straying from the rules is likely to delay you and everyone in line behind you. • Stow your bag in the overhead bin with the wheels in first. This leaves the handle where you and others can grab it to reposition the bag to make room for more stuff in the bin. • Don't put bags in lengthwise. More bags will fit in the bin if they are all positioned perpendicular to the aisle, preferably standing on edge. If your bag is too large to fit that way, it should be checked. And remember: smaller jets mean smaller bins. • Put your larger item up top, your smaller item at your feet. This reduces the clutter at your feet, allowing you and others in your row to ride more comfortably and get in and out more easily. • Use the bin directly over your head, or as close as possible. Letting your bag squat in someone else's bin is just uncool. It robs others of space that is rightfully theirs and singles you out as a self-serving boor. It also isn't likely to speed your egress from the plane, as the aisle is going to be jammed after landing no matter where your bag is stowed. • Don't commandeer another passenger's under-seat space. You are entitled to the space under the seat directly in front of you, and that's it. Once the plane reaches cruising altitude, you can pull your item back so it sits behind your feet and you can stretch out your legs. • Make sure your bag is light enough to lift over your head yourself. There will be exceptions, of course, in cases of age, infirmity or injury. Kind fellow passengers often will be willing to help, but you should not count on it -- and certainly not demand it. • Get your stuff before takeoff. Before settling into your seat, retrieve from your bag any items you're likely to need during the flight -- book, pen, medicine, PDA -- so you won't have to stand up and rummage through the overhead bin during the flight. • Wait until everyone's bags are stowed, then lay your coat on top. Bags take priority in the overhead bin. Ask a flight attendant if there's space in a forward closet for your coat. If not, hold it in your lap until all bags are stowed, then get up and try to jam it in on top. If there's no room, drape it over your seat and sit on it.